What: Raccoon on a bike, mural by Moises Frank. Where: Birchmount Bluffs Neighbourhood Centre Bike Hub, 93 Birchmount Rd. Why we think it's dandy: Because raccoon + bike = OH SO TORONTO! 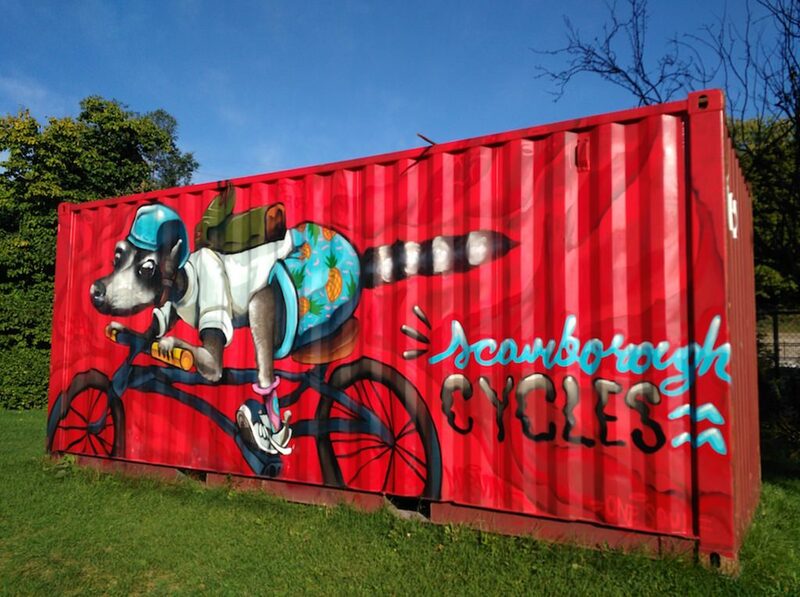 "We concluded that a raccoon best represented our city and thus it became the icon for the cyclist on the storage container," said artist Moises Frank. "The community response to the mural has been overwhelmingly positive, and we think it makes a great background for our activities at the hub, especially since there is nothing in the community that look like it. We think the mural definitely helps with our efforts to build bike culture in Scarborough, through identification and placemaking, said Marvin Macaraig, Community Health Worker and Scarborough Cycles Bike Hub Coordinator at Access Alliance Multicultural Health and Community Services on the Danforth. Here's a couple of neat time lapse vids created by Moises of the front and back. Have you spotted something awesome and bike-y? Send it to us at bikespotting@dandyhorsemagazine.com and we might just publish it here! Bike Spotting: What's your favourite bike lane?